Safe Sitter is a nationally certified babysitter training course for 11-14 year olds. This instructor-led class is filled with fun games and role-playing exercises. Students learn: Safety Skills, First Aid & Rescue Skills, Life & Business Skills and Child Care Skills so that they are safe when they're home alone, watching younger siblings, or babysitting. 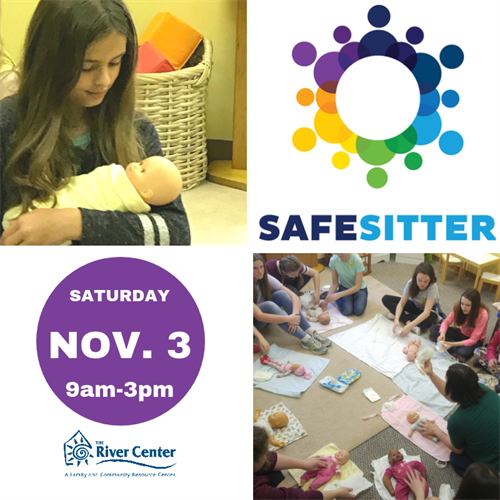 Participants will receive a personal copy of The Official Safe Sitter® Babysitter's Handbook and completion card at the end of the course. There will be a 30 minute lunch break plus short breaks during the day. The River Center: A Family and Community Center strives to make these programs affordable to all. If you are in need of financial assistance, call us at 924-6800 or email at info@rivercenter.us.